The foaling season for 2005 is now over and we are delighted to have three healthy colts safely foaled. 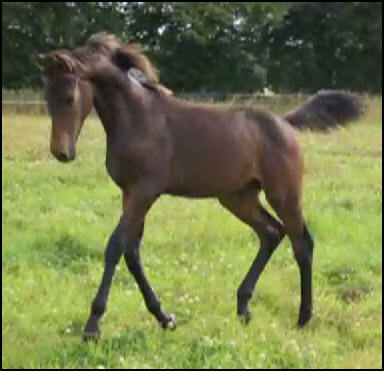 The foals may be for sale, please contact us for more details if you are interested. For further information on their dams please visit the broodmares page. Hazel Park, our thoroughbred mare, had a stunning bay colt foal on the 29th March at 1.30am. His sire is the outstanding Oldenburg, Premium Hessen and British Warmblood stallion Rubin Star N. Rubin Star N is a 16.2hh black stallion who won his 100 day performance test with amazingly high marks in both the dressage and showjumping sections. Please click on Rubin Star N's image to visit his website. Blacklaw Rising Star has no white apart from a tiny star and it is obvious even at this early stage he has inherited his father's elegance, presence and great uphill paces. 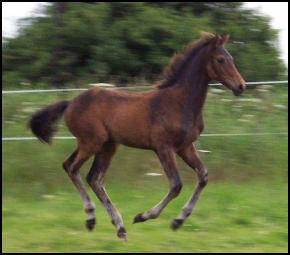 He is a gorgeous and inquistive foal, a definite dressage/eventing star in the making. 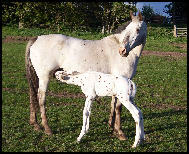 Vixen KNN 1608, our whiteborn Knabstrupper mare, had a huge leopard spotted colt at 10pm on Wednesday 4th May. 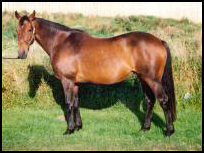 His sire is the Knabstrupper stallion Xantast Middelsom KNN 126. 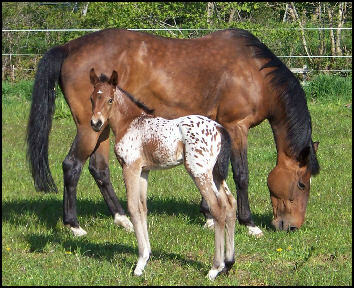 Xantast is a 16.2hh bay leopard spotted graded stallion by Xanthos KNN 112. 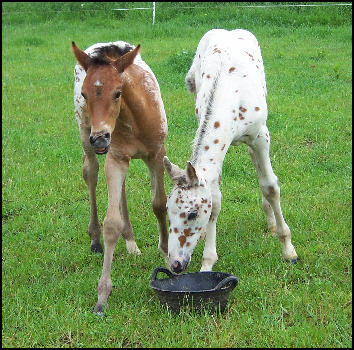 Please click on Xantast's image to visit the KNN stallion list. Xcalibur is a strikingly marked colt with an easy going, friendly temperament. 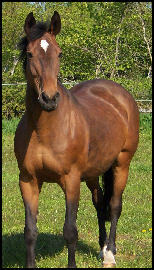 He is a large imposing foal standing 11.2hh at just one week old and will probably mature in excess of 16.2hh. He has loose elevated movement with a ground covering stride. He is a top class, purebred Knabstrupper colt who should excel in the dressage arena. We have decided to retain Xcalibur until he is 2 years old to ensure that he has the opportunity to go forward for grading as a Knabstrupper stallion. Please click for more photos or for pedigree details. 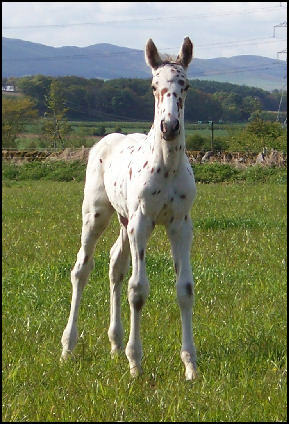 Honeybrook Lauranda, a Grade A showjumping mare, in foal to The Commandant, a whiteborn British Appaloosa stallion. 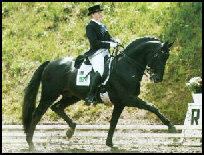 He is by the renowned stallion Klaus. 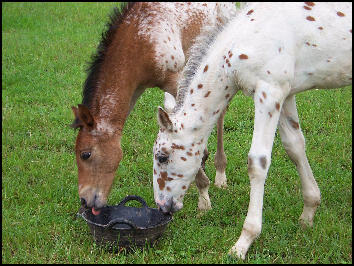 This foal will be eligible to be registered as a partbred Appaloosa and should make at least 16.1hh in height. Lauranda passes on her showjumping ability to her foals and we would hope that this foal will have a showjumping future. Lauranda had a stunning, quality colt foal at 10pm on Sunday 8th May. This foal oozes character and is utterly adorable. 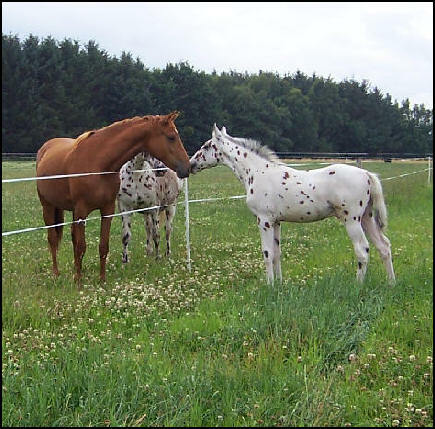 He is a very confident foal who loves interaction with people. He has a very pretty head and good topline. 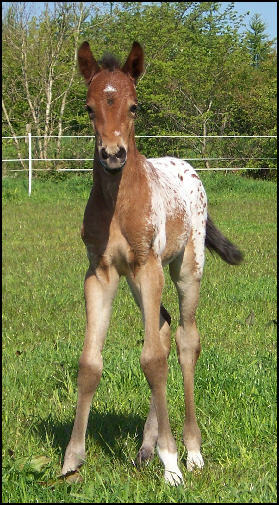 He is a refined foal with a light springy step. Cloudy Bay has fantastic potential as an eventer or showjumper and will be very hard to part with. He is already roaning out on his head and neck and will probably mature as a near leopard.